Headline News: I am Taking Sticky Clown Up on His Offer! Trivia, the answers will be on the following issue. 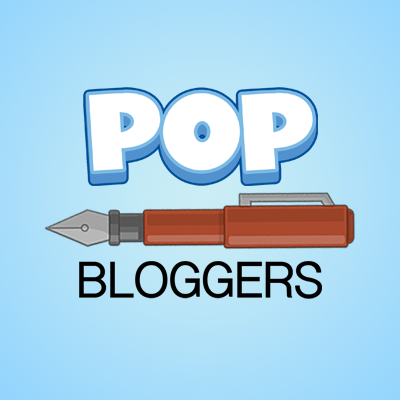 An ad featuring another blog, requested to me or PD at shypoptropica@hotmail.com or perfectdolphin1490@hotmail.com. Now, I know what you’re probably thinking. “How on Earth will PD and Double S be able to maintain all that on their own? !” We won’t be able to. That’s why we are going to have a MAJOR staff upgrade. I’m not going to just point at somebody and demand that they help me. I’m going to have a contest. A contest for each of the things listed above. Listed below, are things required for each contest. Trivia: I will need to know how much you know about Poptropica history. This can be done in an essay in a comment, timeline emailed to me, etc. Glitch: For this, we have two options, because the first may be too hard. #1: Find/create a glitch never found or thought of before. #2: List all the glitches you know in a comment below. Costume: Create an original costume that came from YOUR MIND! Now, we also have some rules. Use what came from YOUR MIND and ONLY your mind! You may only try out for one of the new options. ALWAYS follow original website rules. Well, I think that’s all I have to say. This classic flavor bubble gum is bursting with flavor! Get it now, absolutely FREE! I am shy and I go on Poptropica, and sometimes I yell at my keyboard. Don't judge me! I am a boy, though. 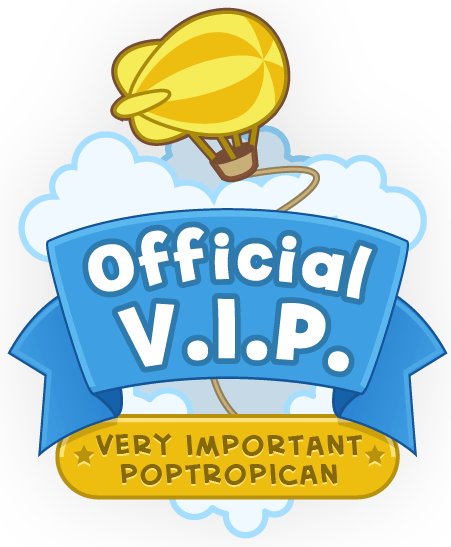 2007 : The Beta version of Poptropica comes out in September with the only island being Early Poptropica. In honor of New Year’s, Shark Tooth is released in late December. The island did not have the carbonated coconut milk and beating it was only possible by beating a Yogos/Fruit Loops ad (I forget which one). The player would obtain a propeller beanie. The player was not allowed to put on the beanie at Booga Bay, but if the player already had it on, the game allowed him/her to keep it on, letting the player sail over the shark. This glitch was fixed and the carbonated coconut milk was added a few months later. 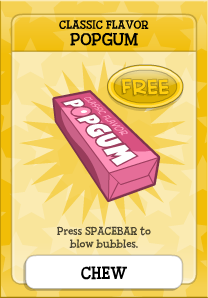 2008 : A big year for poptropica! Time Tangled Island, formerly called Time Twisted Island, but I really don’t think it was ever called Time Lapse island, was released in May. It was a huge hit. At this point, Monster Carnival could be seen on the map, labeled “Coming Soon!” No one knew anything about it, and one day, it changed to 24 Carrot. I have a couple questions first. The advertisement is new, can we apply for that? Can people send in costumes that they want to be featured? I would like to apply for either the Costume or Advertisement. I love making costumes, but I can’t think up a new one every week. Thus my question in my comment above. I especially like trying to make costumes based on different people/things. Like a person/thing from a T.V. show. I have also won the PHB Halloween Costume Contest before. To see some of my costumes so far you can go here and here. 😎 Most of my costumes are even featured on the PHB. I personally like writing news articles in general. I even had to make a newspaper for a school project and I got a really good grade. I especially enjoy telling people how good things are, thus advertising. I’m not sure what else to say though. The advertisement isn’t new. It’s ALWAYS been there.